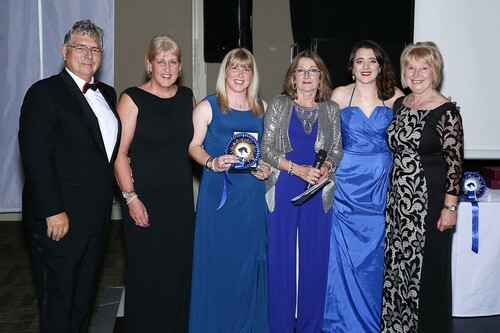 The Arabian Horse Supporters Awards Ball has been held, since its inception in 2015, at The Mere Golf Resort and Spa in Cheshire. The annual gathering of Arabian horse enthusiasts was the brainchild of Jayne Armstrong, who felt an end of season celebration was just what the community needed. It’s a chance to get glammed up and pamper yourself without a horse being involved, to meet friends old and new while enjoying a sumptuous three course meal in plush surroundings before dancing into the wee small hours. 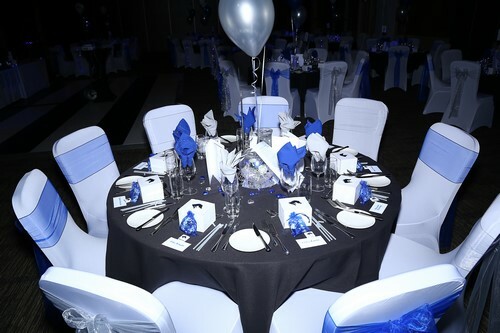 This year’s theme was electric blue and silver, with the suite beautifully decorated in these colours, and table accessories and party- goers alike were adorned with the colours. It made for a stunning setting and gave the ladies (and gents!) some inspiration when looking for their outfits. Every year, the Ball raises funds for a charitable cause, previous years have seen the Air Ambulance benefit. This year was the turn of the Arabian horse charity, Prince Fluffy Kareem (PFK), a UK registers charity based in Cairo, Egypt. Their mission is to help the animals working by the pyramids of Giza; they treat mainly horses but also lots of camels and donkeys. Animals in Cairo are used to take tourists and Egyptian locals on rides around the Pyramids and in the surrounding desert. They are also used as transport, they pull carts selling local produce, and work hard for their owners. Many of the Pyramid horses are in shockingly poor condition, usually caused by a combination of reasons. The uprising in 2011 caused a dramatic drop in tourism, and similarly affected the income of local horse owners. PFK offers all treatment free of charge, whether that is feeding a horse for two months, x-rays, wound care, farrier work or surgeries. Most important of all, they educate. Nothing can change the financial situation in Egypt, but teaching the owners to better understand their animals’ needs can only help improve the lives of the animals living and working there. 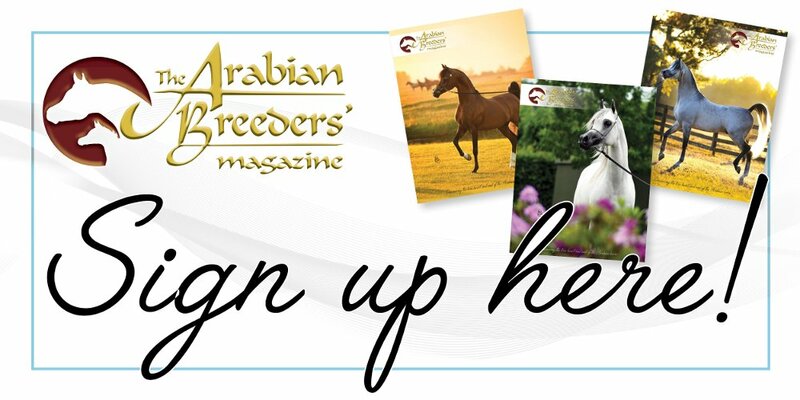 The prizes generously donated for this raffle ranged from beautiful Arabian halters, to a pallet of bedding, to a free night’s stay in The Mere Hotel, to clothing, showing accessories and products and much more! 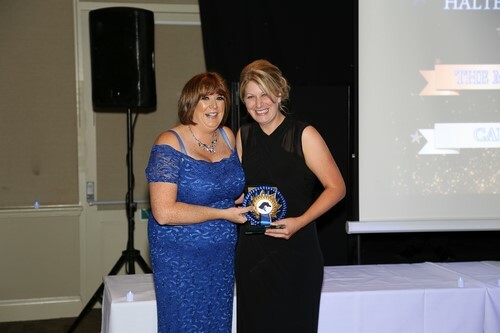 Paula Shenton with Jayne Armstrong (right) Arabian Ambassador of the Year. Those kind words from PFK really do put into perspective how much our money actually means to the horses of Cairo. Well done everyone. There was also a collection of old pound coins in aid of Cancer Research, which raised £16.80; every little helps! As part of the format of the Ball, there are also special awards, nominated for and voted on in the run up to the event. 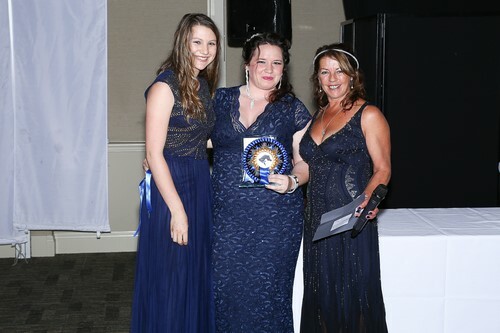 The prizes on offer were beautiful blue and silver rosettes and stunning glass personalised trophies. Briony Jump (centre) was the Best Groom or Assistant. It was lovely to see everyone in their beautiful dresses and smart dinner jackets, and even a couple of kilts! It was a world apart from normal horsey attire – so much so that it was difficult to recognise people so often seen at shows! As usual, the meal was delicious and The Mere pulled out all the stops to cater for all. 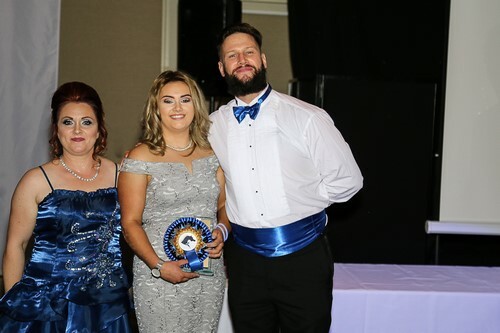 The awards were presented between courses by the fabulous John Norcott, who also provided the rest of the evenings’ entertainment, not forgetting a few numbers also sang by our own Katie Gore. John has sung at the Ball for the last three years and is a firm favourite, always ensuring the dance floor is filled and the best songs are on his playlist. 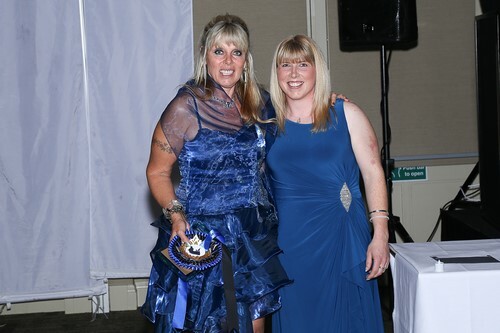 Jayne has assured us that the Ball will run again next year and the date has been set for Saturday 13 October 2018. The Mere has been provisionally booked, subject to numbers. This truly is a fabulous event so please support it and show everyone that it’s not just the horses who can be turned out and glammed up to perfection! 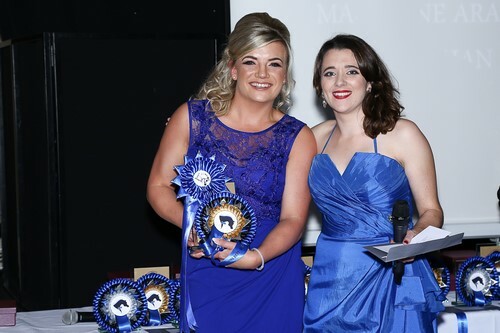 Katie Gore (left) took the prize for Arabian Breeder Under 10 Horses. 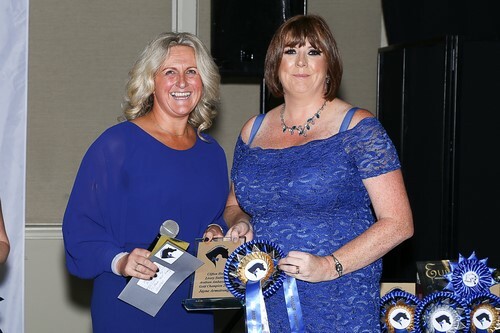 Andrea Taylor (left) was named Arabian Breeder Over 10 Horses. 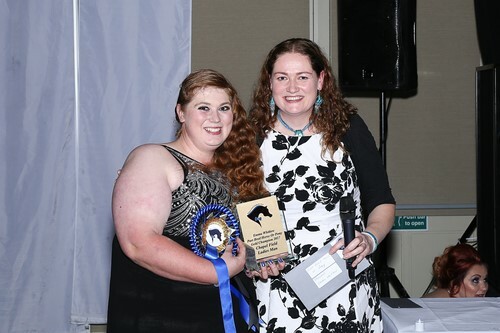 Jayne Armstrong presents Kirsty Nelson (right) the prize for Arabian Horse Enterprise for The Meads. 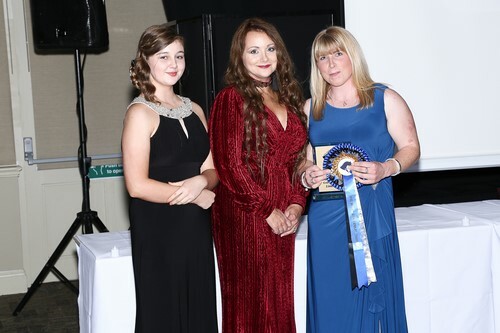 Sian Beeley (left) and Stacey Howarth (centre) collect the prize for Purebred Arabian horse for Prince Psyche. Lindsey Dean (right) was named Best Show Handler. 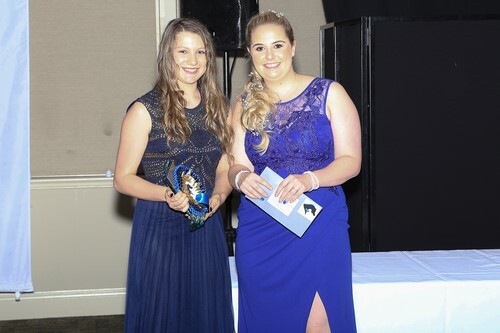 Sian Beeley (left) was named Arabian Horse Young Handler. 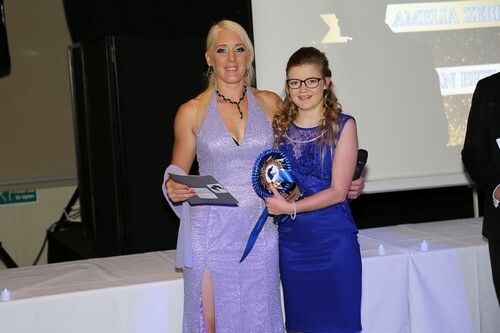 Vikki Morris presents Amelia Zebedee (right) with the Arabian Horse Young Rider Award. 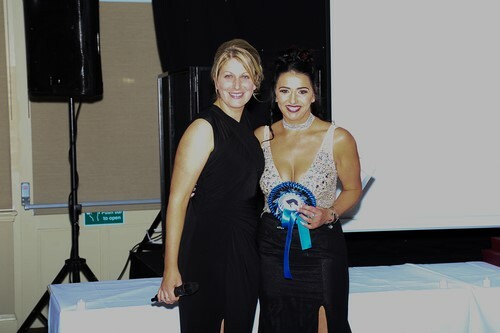 Sian Warman-Randell was the Silver Best Show Rider winner.